Welcome to the Guilford Hills Library! We are dedicated to supporting the curriculum and building-wide literacy programs of the Guilford Hills Elementary School. 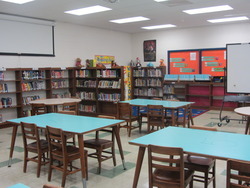 The library is available for all Guilford Hills students, parents, and staff. Students are encouraged to exchange books on any day even if it is not their library day. Please feel free to search our Online Catalog. Click here for a list of all Caldecott Medal and Honor books.